Total trekking distance: 13-14 kms approx. Legend has Story about the falls is that the beautiful princess who lived in the kingdom close to the falls used to take bath in the streams of this falls and after completing it she used to drink the sweet milk in golden jug and on one such day after completing her bath she found she was. Being watched by a prince, Red with embarrassment at her inadequate bathing attire, she poured the jug of to water and entered the water to cover her body in the mean while the maids rushed to cover her with her dress. 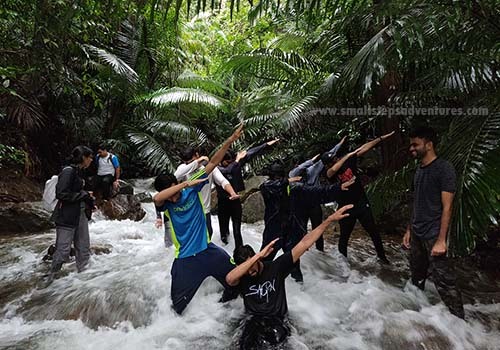 It is said that it is that sweetened milk that cascades down the mountain slope as Dudh sagar Falls to this day as a tribute to the virtue of the princess. 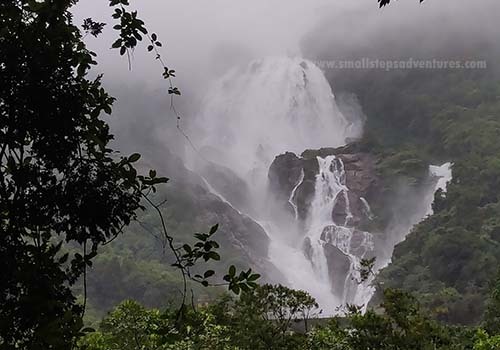 Dudh sagar Falls lies in the Bhagwan Mahavir Wild Life Sanctuary having much wildlife in it and this falls is one of the world's most exquisite falls. It lies high up in the Mondovi River's watershed, during the monsoon season falls are transformed into one of the most powerful falls in India. Dudh sagar Falls is listed as India's fifth tallest waterfall and is 227th in the world at 310mtrs. 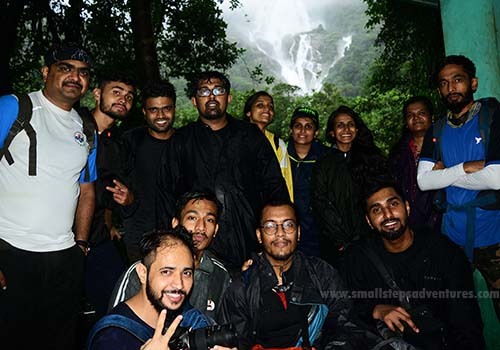 We Organize Outings to Dudh Sagar Falls regularly and this falls is at a distance of 550 kms from Bangalore and outings include Transportation from Bangalore to Bangalore inclusive of Camping / Home stay accommodations with trekking to Dudh Sagar Falls and bonfire camping. 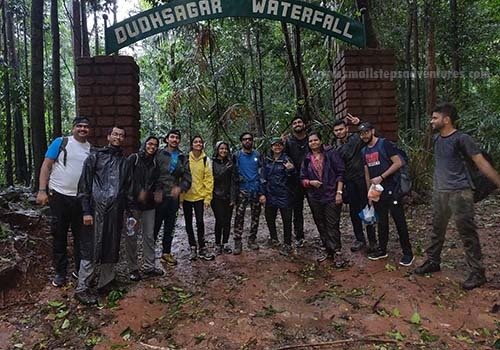 This trek is must do for all trekkers / nature lovers / anyone interested in exploring nature due to the picturesque surroundings this place poses at the beginning and on the process takes you into its dream world of exotic views and we head in to the shoal forest of Western Ghats to reach the guest house near the falls maintained by Karnataka Forest Office. 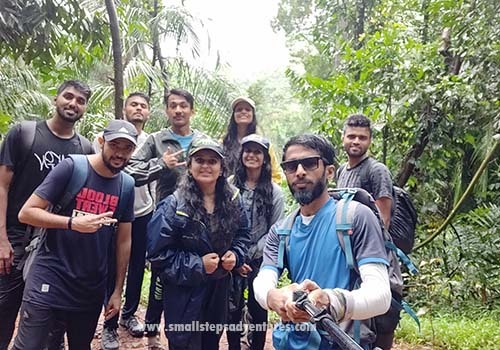 This place is surrounded by Bhagwan Mahavir Wildlife Sanctuary which is infiltrated with Wildlife, if you are a regular Trekker; the important thing to do first is take prior permission from Forest Dept before going on a trek and be guided. 08:30 PM Start From Bangalore. Pick up points ( Marthahalli, Silk Board , BTM. Banashankari Bus stop & RR Nagar Gopalan Arcade) Start Journey Via- Tumkur Toad, Hubli, Dharwad). 10:00 PM Reach Back to Bangalore. ● Total trekking distance: 13-14 kms approx. 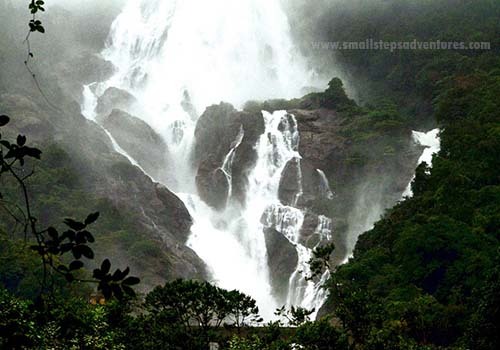 ● Attraction: The Dudhsagar Waterfall. ● Lunch on Sunday and any other thing is not mentioned in the includes during travel. ● Fresh up Rooms in the Hotel are sharing basis. ● Basic Fitness should be Required. ● Tents & sleeping Bags will Be Distributed & to be Carried by self. ● Twin/3 Basis Tented stay. ● Dont expect Electricity & Luxury in the Camping area. ● Rucksack/ backpack to carry your personal belongings (preferably water proof). ● Sleeping Bag or couple of blankets/bed sheets. ● Dress change for 2 days along with a swimming costume & few plastic covers to keep wet cloths. ● Torch with extra batteries (Strictly no mobile torch). ● Personal medicines if you use any (General first aid would be with host) & ORS packet.